Summer is here!! In Louisiana that means heat, humidity and Watermelons!! Washington Parish has some of the sweetest! (Yes, Louisiana has parishes not counties… weird I know)! Watermelon is one of my favorites, and I always anxiously await its arrival every Summer! Unfortunately, I could eat my weight in watermelon, so I often skip out on eating it just in case I lose self control! 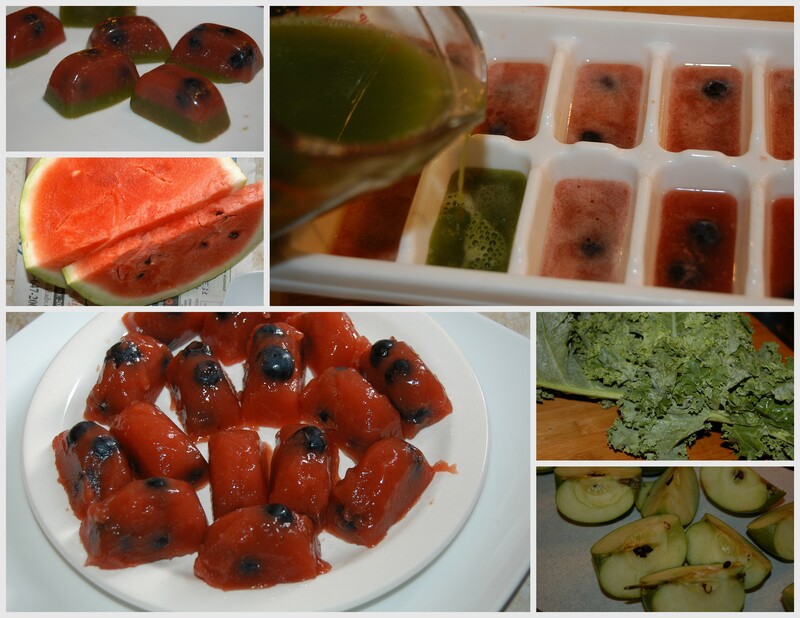 Last Summer, I created a Watermelon Popsicle to help control my portion size, and this Summer I decided to make Watermelon Jell-O. It’s the perfect size, it’s fun, it’s yummy and it’s super cute! 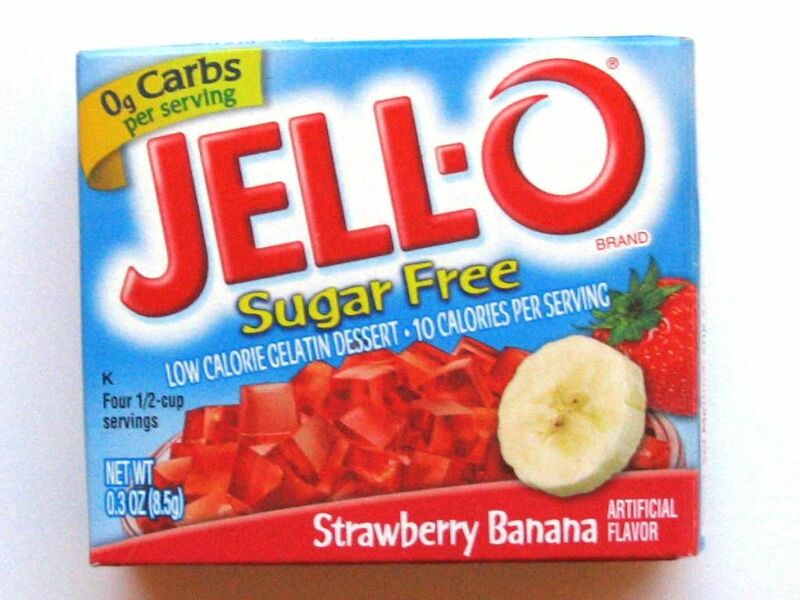 Gelatin, Adipic Acid (for Tartness), Disodium Phosphate (Controls Acidity), Maltodextrin (from Corn), Fumaric Acid (for Tartness), Aspartame (Phenylketonurics ContainsPhenylalanine) (Sweetener), Contains Less than 2% of Artificial Flavor, Acesulfame Potassium (Sweetener), Salt, Blue 1, Red 40. Wow, that’s a lot of ingredients for gelatin, and NOT ONE of the ingredients do I feel comfortable putting in my body or giving to my son! Not all gelatin is equal. The average person doesn’t know that gelatin is a protein that comes from the collagen found in bones, skin and connective tissues of animals. (This is why when making homemade bone broth, it becomes very gelatinous after it has cooled and the reason it is SO good for you!) For more information on how gelatin is produced, click HERE. It is VERY important that the gelatin we consume comes from grass-fed animals and that it is properly processed. Great Lakes is one of 2 brands that I know of that provides high quality gelatin from grass-fed cows or pigs. Not only is Great Lakes gelatin used to make puddings and gelatin desserts, but it is also used as a supplement, offering health benefits by providing useful collagen for our joints, skin and nails. Many people who use Great Lakes Gelatin on a consistent basis begin to notice improvements in their skin and joints (read the reviews HERE). I personally saw improvement in varicose veins and the disappearance of a ganglion cyst on my foot during the last few months of pregnancy (using more coconut oil and Great Lakes Gelatin were the only changes to my diet). It is the ONLY protein powder/gelatin (it provides 6 grams of protein per tablespoon) that I recommend and use. The RED can (Red is Kosher) or ORANGE can is used to make things thick (like in this recipe), and the GREEN can, dissolves in cold water and is used as a protein powder or supplement. Great Lakes seems more expensive, but it really is not! A box of Knox gelatin in the store costs a few bucks for just a few tablespoons, and a 1 lb canister of Great Lakes cost about $17 (contains 64 tablespoons which cost .25 per tbsp). 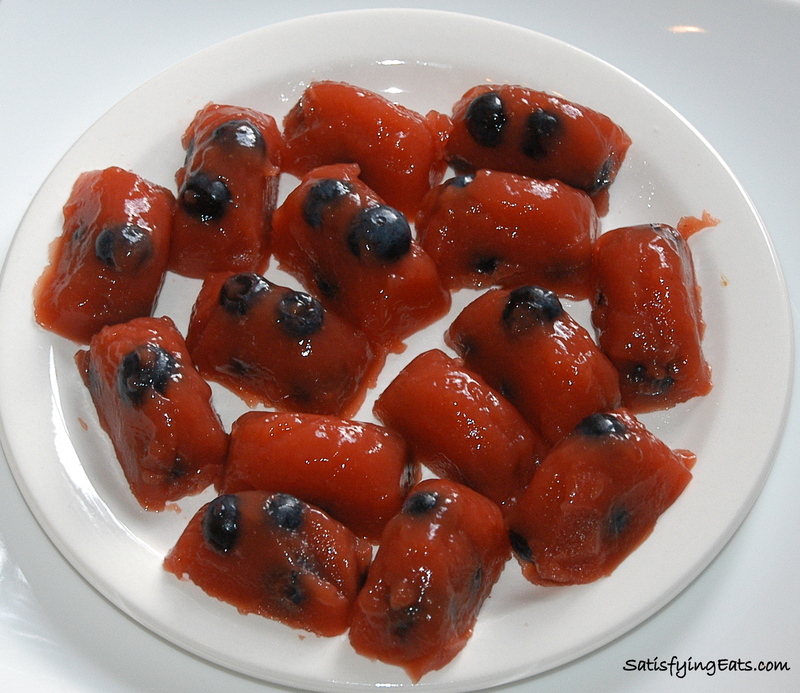 Be sure to use the Red or Orange can of Great Lakes Gelatin for this recipe. If you use the Green, you will get the health benefits but it won’t gel. Feel free to use any juice, but fresh is ALWAYS best. I used watermelon because I had leftovers and I love the taste. I also chose it because it is not super sweet. I added a few strawberries to enhance the flavor. You can use your juicer for this recipe. For the green “rind”, I juiced granny smith apples and a few leaves of Kale. The Kale is really what gave it the green color. I could have also used spinach. If you don’t have a juicer, place the apples, kale and 1/4 cup of water in the blender and blend for a few minutes, then drain through a fine mesh strainer like THIS ONE. You should be left with pretty green juice. I used about 6 small Granny Smith apples and 4 leaves of fresh Kale to get 1 cup. The quantity of fruit needed to produce the correct amount of juice will vary depending on juicer or method used. There is no need to de-seed the watermelon or apple, the seeds will be strained out. The watermelon (and strawberries if you choose) don’t have to be juiced either. You can just blend in a blender. Using a blender and not straining the pulp will created a thicker gelatin, more opaque (if blending without straining, be sure to pick out seeds of watermelon). For the large watermelon Jello below, I didn’t strain the pulp but for the mini ones, I did (so you can see the slight difference). You don’t have to do 2 different layers…you can choose to do 4 or 5 different layers (and colors) to create a rainbow. 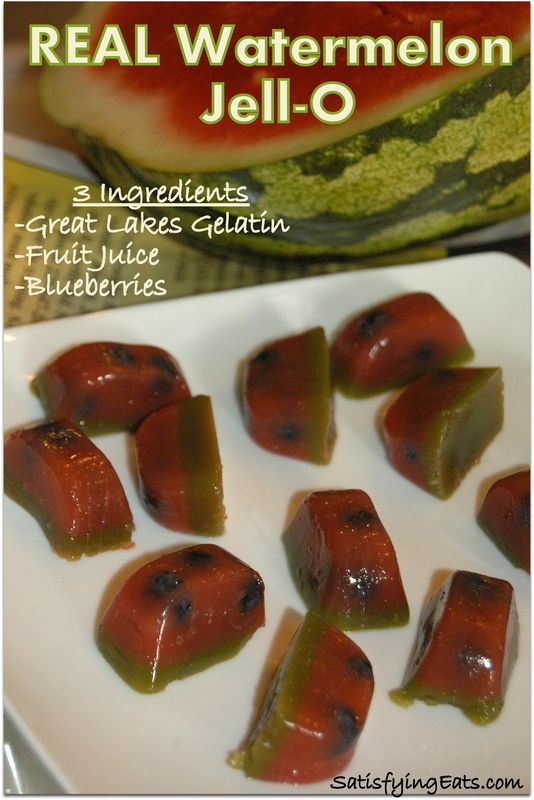 Use 1 tbsp Great Lakes gelatin to 1 cup of liquid to create a Jell-O consistency. I only used a few servings of Kal Stevia to sweeten each layer. The amount of sweetener needed will vary based on the sweetness of the fruit. Sweetener in this recipe is truly optional. Pour 1/4 cup of juice into a small sauce pan. Sprinkle gelatin over the top in a thin layer. Allow to sit for 1-2 minutes. Turn heat to medium then whisk gelatin into juice until dissolved. Bring juice to temperature (juice should be very hot but doesn’t have to boil). Once juice is hot, turn off heat. Add remaining juice. Taste for sweetness and adjust if needed. Coat your bowl or container with olive or coconut oil. Wipe off any excess oil (there should not be any excess oil left in the bowl). This will ensure an easier release. Pour prepared gelatin into the prepared bowl or container. Place in fridge and allow to congeal. 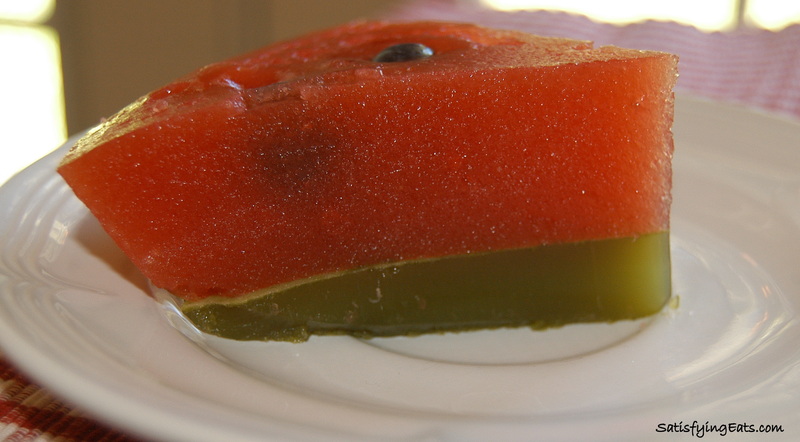 Prepare the Watermelon Gelatin at this time. Pour 1/4 cup of juice into a small sauce pan. Sprinkle gelatin over the top in a thin layer. Allow to sit for 1-2 minutes. Turn heat to medium then whisk gelatin into juice until dissolved. Bring juice to temperature (juice should be very hot but doesn’t have to boil). Once juice is hot, turn off heat. Add remaining juice. Taste for sweetness and adjust if needed. Pour into a bowl and place in the fridge for about 10-15 minutes or until it starts to thicken. Check to see if the “rind” has cooled and congealed. 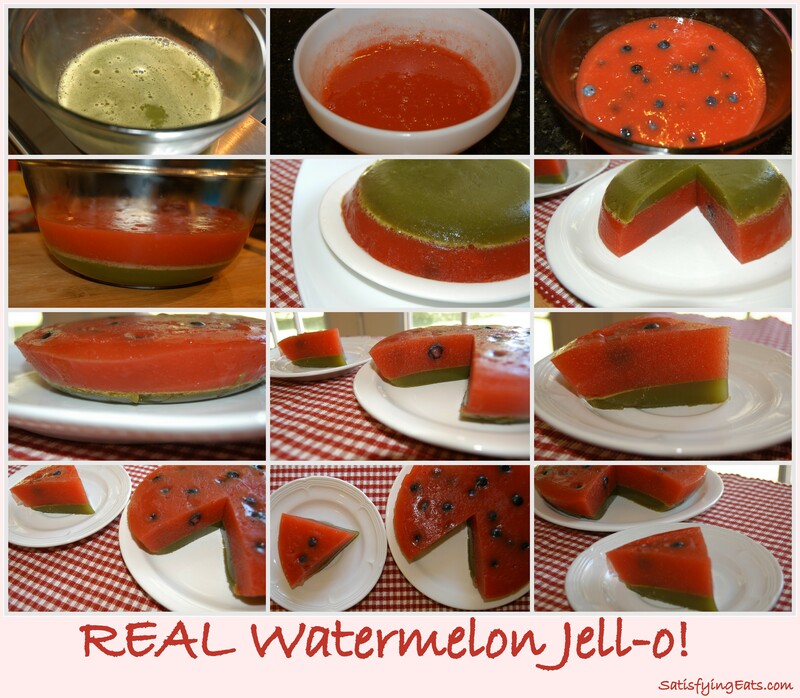 If so, pour partially congealed watermelon gelatin over the set green gelatin. Add blueberries. They should suspend in the jello but not sink all the way because it has only partially gelled. NOTE: If the red gelatin is relatively cool, you can pour it directly over the green gelatin as long as it is set up skipping the step of pouring it into a separate bowl to thicken. Refrigerate for at least 4 hours or over night. When ready to serve, run a knife around the edges of the gelatin and then place a plate inside the bowl (covering gelatin) and invert. Gelatin should release. If not, place bowl in hot water to help with release. Prepare 2 ice trays by coating the insides with olive or coconut oil. Wipe off any excess oil to be sure there is no oil left standing in ice trays. Add 3 blueberries to each well. Pour about 2 teaspoons or fill the ice-cube trays about 2/3 way up. Place in fridge and allow to congeal. This should take between 5-10 minutes. After congealed, remove from fridge and pour about 1 tsp or fill the remaining well up with the green gelatin. Place back in fridge for 2 hour minimum. 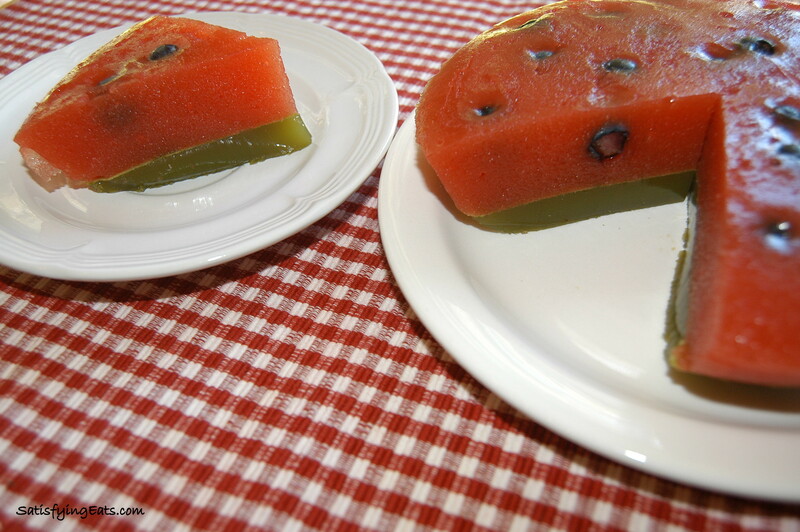 To remove, slide knife down one edge of gelatin cube while turning ice-cube tray on side. The little gelatin cubes should just fall out (with the help of the knife).